The Transcaucasian Expedition departs today – in a Land Rover Bursary-awarded Defender! There’s nothing like a brand spanking new Defender 110 rolling onto your driveway to tell you that things are about to get real, real serious. And I’m not much of a petrol-head, but I will admit that there is a twinge of excitement about the vehicular aspect of this expedition. It’s not just because the truck in question looks like the love-child of MacGyver and Mr T.
No; what excites me is that this off-roading beauty is going to make the building of the Transcaucasian Trail possible. As I’ve written before, I could have simply headed out on foot with a GPS unit and started walking. The minibus to the border town of Meghri takes 5 hours and costs £8; from there, I could have kept walking until I got to the other end of the mountain range in the delightful seaside town of Batumi, then gone home and celebrated another heroic ‘expedition’. It would have been fun. It would also have been pretty much entirely self indulgent. Been there, done that, written the book. This project – to create a 1,500km hiking route the length of the Lesser Caucasus – comes from another place. I love this part of the world, and that’s no platitude; I’ve invested my future here, and despite the struggles that come with living among the remains of the collapsed Soviet ideology, I feel more alive and purposeful working to make things better here than I could ever feel while struggling to pay the rent in the land of my birth. But I digress. About six months ago, I was browsing the used car market in Armenia, eyeing up the legions of used Russian 4x4s. I would need such a vehicle to transport my team and our mapping & camera gear to the most remote corners of this wild and mountainous region to carry out our work. 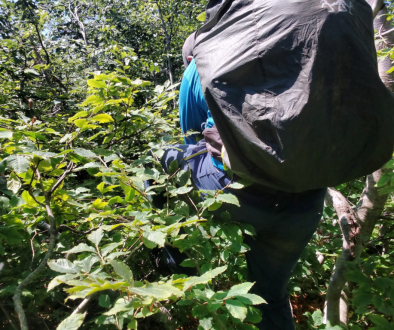 And I was wondering who might volunteer to spend their summer keeping the thing on the road – not to mention where on Earth I was going to find the financial backing to develop the first long-distance hiking trail across a nation. Well, I no longer have to worry about either of these things. 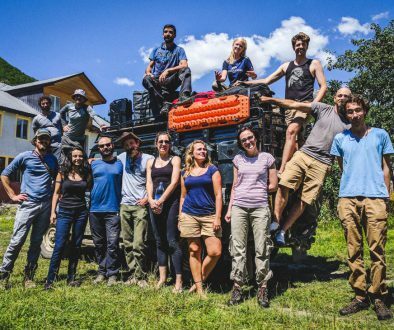 Because the Transcaucasian Expedition has been awarded the 2016 Land Rover Bursary. This is a complete and utter godsend. 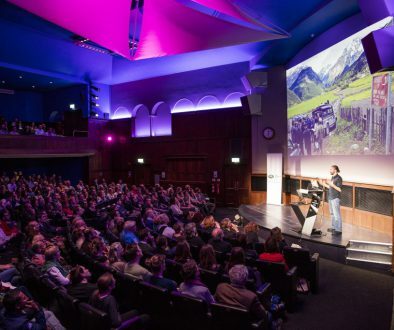 The charitable bursary, awarded once a year by the Royal Geographical Society in partnership with Land Rover, is ‘coveted’ for a reason. The official blurb mentions the use of the world’s most iconic off-road vehicle – the Defender – and up to £30,000 to cover the costs of the expedition. These are, of course, two astoundingly useful things. But as I’ve been discovering over the last few weeks, there is much more involved in a partnership like this than a set of car keys and some cash. Perhaps the most significant of all for the project is the audience that will be party to this little escapade, as a result of the immense reach of the supporting organisations. For all I know, you, dear reader, could have followed a link here from one of Land Rover’s social media channels and be midway through reading your first article about this expedition. As a result, it may have dawned on you that you could really do with a reminder of where the Caucasus actually is, and you will already have scanned the top menu and sidebar of this website in search of an appropriate-sounding link (try this one). You’ll have picked up on my repeated mentions of the expedition’s objective to build a long-distance hiking trail, perhaps seen a couple of the photos, and thought to yourself that you might, in a few years time, if and when the trail is finished, perhaps consider heading over and hiking a section or two. If you’re really procrastinating, you might even have quickly checked on the price of a short-haul flight from Europe to Tbilisi or Yerevan and found them to be astonishingly reasonable. My point is that while many media-driven expeditions can be somewhat self-aggrandising, all I really want to draw attention to is how overlooked yet how utterly wonderful the Caucasus region is for outdoor exploration and adventures. And it will only become more accessible as our project works to improve the mapping of the region. The goal is to develop safe, sustainable and spectacular backcountry routes through the region – beginning with a little idea called the Transcaucasian Trail. Being able to spread those messages far and wide through the Bursary partnership is, to my mind, every bit as helpful to that goal as the physical and financial components of the grant, if not more so. And I am deeply grateful to the people I’ve had the pleasure of working with at the RGS and Land Rover (you know who you are) for giving our project this kind of exposure and support. Did I mention that the Defender 110 that Land Rover SVO have built for us is completely awesome? Last week, my teammate Alessandro and I, along with our cameraman Ben, were invited to Eastnor Castle estate in Herefordshire, where Land Rover have been testing their vehicles since the 1960s. We were subjected to 3 days of training in the off-road driving and bush maintenance of the Defender – a compulsory part of receiving the Bursary. Defenders are rare in the Caucasus, and with off-road trails being the focus of our project and our vehicle maintenance skills being approximately non-existent, I was expecting the training to be somewhat informative. And I very much hope we never have to actually use any of the tricks we performed in the woods of Eastnor estate. It is seriously impressive to experience what this thing is capable of in the right hands. It is terrifying to contemplate having to do any of it for real, outside of controlled environments and without expert instruction. I think this is the point of the training. Having taken the Defender close to its limits, I’m now aware of what I’d be comfortable attempting, and what would cause me to pull a U-turn and look for a Plan B. In the meantime, there’s the small matter of getting ourselves and our kit out to the Caucasus. We could have shipped the vehicle, but I decided it might be fun to drive it there instead. We leave today on this road trip across Europe and Turkey to the Caucasian nations of Georgia and Armenia. After all, I keep trying to convince people that Georgia and Armenia really aren’t that far away. Going overland seems like a cute way to demonstrate that. It only took me 8 months to do it by bicycle. In a vehicle, it’ll be a matter of days. By the time you read this, we’ll be on the road. Today is Day One. And I’d absolutely love it if you joined us vicariously for this journey. There’s a full summer of pioneering travel and exploration ahead, and it’s my hope that you’ll be tempted to shift a visit to the Caucasus – and perhaps hiking the Transcaucasian Trail? – a little further up your bucket list as a result. The best place for following the journey will be Instagram, where myself, Alessandro and others will be posting under the hashtag #transcaucasian. There’s also this pretty neat live tracking map. And if you’re interested in joining the growing community around the Transcaucasian Trail and staying in the loop as our work progresses, there’s a Facebook Page for that too. Thanks for reading. Do stay with us in the coming days as the journey to the Caucasus commences! Congrats Tom, this trail will be a gift to the world and the region for countless years. So inspired! Good luck guys, sounds like plenty of fun to be had over the next few weeks! I’m getting in touch to send my very best wishes for the venture! You wont remember me but I contacted you when your ‘leave before you are ready… leave now’ piece in your bike packing website struck such a cord that I set off to solo cycle from Bath, England to … well destination still to be decided !! I am currently in China and will be teaching here for a while before setting off again! I left England a couple of months before my 40th birthday, hopefully dispelling some of the ideas that such things should only occur in one’s 20’s …luckily I received lots of good wishes as well as some utter bafflement! My route took me through Georgia … amongst many other places … and yes I am with you … it is an utterly amazing country, one very dear to me. I saw such incredibly beautiful landscapes and was constantly met with warmth and generosity. I’m sure you will increase Georgia’s visibility through this venture and will reach many other souls who are itching for adventure, kindle that spark and start them off on their own travels … to Georgia and beyond! I’m excited to see how things progress … not least because I’m currently static!! Travelling vicariously has a temporary place in my life! You guys are truly amazing, taking on this project. Hopefully, your vision of this 1500Km. trail will realize all that you’re hoping to get accomplished. We’re rooting for you. Excellent! Hope that I will someday use this path, thanks to you and your back-up crew for doing this. But if you have sponsorship the comment above doesn’t mean a thing. Best of luck to you and I will be following your travels and can’t wait for the film. I wanted to be with you right now!! Thanks for sharing this with all of us. My class of primary aged pupils followed Leon McCarron on his #walkthemasar journey recently. He suggested that I look up your trip as a next area of the world to explore with them. Looking forward to learning about the Caucasus!